Guests of the Bally's � Hotel expect the excitement and fun that a hotel on Las Vegas's strip offers. When they decide to head to bed, regardless what time that is, they quickly fall asleep thanks to the Pacific Coast � Touch of Down � Pillow. 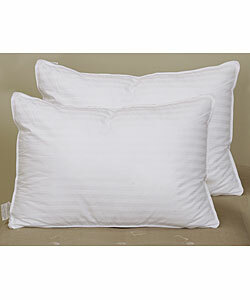 The Pacific Coast � Touch of Down � Pillow is actually two pillows in one. The outer shell of the Pacific Coast � Touch of Down � Pillow is made up of soft 75% grey goose down which gives the pillow amazing loft and comfort. The inner chamber is almost the complete opposite, duck feather, which means support for your head and neck. Overall this means that the Pacific Coast � Touch of Down � Pillow is ideal for any sleep position and even with 75% down has a medium firmness. It is no wonder that Bally's � customers rave about both the bedding and the casino. If you are looking to switch from synthetic to down the Pacific Coast � Touch of Down � Pillow is an excellent entry to feather and down pillows. Also for those sensitive to feather and down Pacific Coast � uses an exclusive Hyper Clean � process that eliminates much of the dander and allergens that could cause a reaction. Pacific Coast � even has a 30 day allergy free guarantee. Experience the Pacific Coast � Touch of Down � Pillow tonight and see what Bally's � customers have known about for years! The Bally's � trademark is owned by Harrah�s Entertainment. ; this trademark is not owned by Hotelpillow.com. It is used on this website for informational purposes to inform our customers that the Pacific Coast � Touch of Down � Pillows are the same pillows featured in Bally's � Hotel. 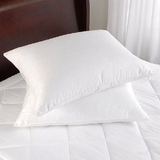 The Pacific Coast � Touch of Down � pillow is manufactured by Pacific Coast Feather Company. The Pacific Coast � Touch of Down � Pillows are not manufactured by Bally's � or Harrah�s Entertainment.